When you are in the groove with your work or a task, you can cover a lot of ground and get things done but interruptions and distractions can have the opposite effect (like re-reading the same sentence ten times and it still not registering!). As a location-based architecture and interiors photographer, I can be tasked with capturing images of real working environments. Spaces devoid of humans can work in some situations, but sometimes having people in the frame helps the narrative: what the space is used for, how we interact with it, providing scale. But, the last thing I want to do is to cause disruption to my clients’ business and annoy folk trying to do their work. So, this is where the Ninja skills come in… I don’t mean back-flipping around a site clad in black, but operating efficiently, discretely, with awareness of the surroundings and sensitive to those working in it. At the core of this is pre-planning and scouting before a shoot takes place. A while ago, I had the opportunity to shoot the unique interior of a working commercial space in the iconic Park Hill development of Sheffield. This behemoth of brutalist architecture has been brought back to life to suit modern living and working thanks to the vision of Urban Splash. With the first phase complete, there are now a range of commercial and retail units occupied below the towering residential apartments above. One of the early adopters to the office spaces has been Yoomee, digital researchers and designers focussed on helping non-profit organisations. Founders Nicola and Andy were visionary in taking the bold step of moving their business into new premises and have worked to create a unique work space that suits their needs. The offices span the base of the tower with dual east and west aspects and house work spaces, meeting rooms and breakout areas across two floors. The fit-out (Ovo Spaces) has celebrated the brutalist fabric of the original structure but with modern fixtures and fittings and vibrant splashes of colour injecting energy and fun. With a complex, occupied workspace such as Yoomee, a scouting trip to site is invaluable. It gave me the chance to understand the space, direction of light according to time of day, build a shot list and meet some of the team there. It helps me to consider my equipment choices and helps to remove any surprises on shoot day. This way, I can get in, make like a Ninja and complete the shoot. For the most part, I was able to work tethered to a laptop (our preferred approach) allowing ‘live’ tweaks to composition, framing and exposure whilst providing an instant back-up of assets. Some of the spaces required panoramic stitching of images made easier with the Canon’s tilt-shift lenses, and thanks to the enormous windows and a cloudy day (lovely soft light), little need for supplementary lighting. It was a really fun shoot of a great space, made all the more enjoyable thanks to Rich Wells who helped shunt some furniture about and kept me caffeinated. A scouting trip to your location is a valuable exercise to help us formulate the right approach to meet your brief. If you are thinking that your work space or business deserves to be shown off in the best way to your clients and customers, drop Clear Space a message or give us a call. We would love to discuss your ideas and help you plan a photo shoot that delivers (back-flips not included). A visit to a healthcare establishment is most likely coupled with some form of anxiety (it certainly is in my case!). However, besides quality practitioners able to look after us, the environment is also an important factor that can influence our emotions and our mind-set even before any treatment takes place: Is it clean? Is it old? Is it cramped? Where do I go? 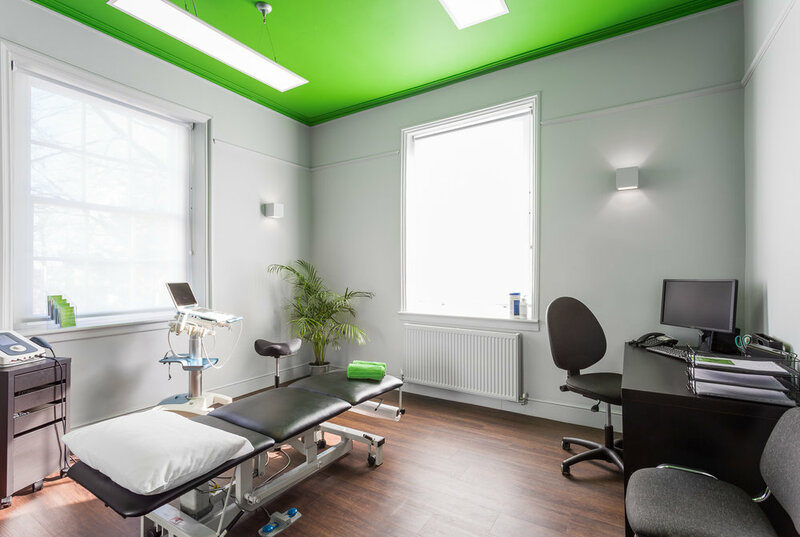 Having had the opportunity to work with the team at The Physios in creating a set of interior images for their practice in Sheffield, my own perceptions of how interior design plays an important part in the healthcare setting has changed. Paul Hattam (Principal physiotherapist and Director) explained how they had transformed an historic building into a set of functional and stylish treatment rooms, reception area and studio to support their services, but had taken efforts to move away from the more traditional branding associated with physiotherapy practices (think clinical blue and white colour palette) in favour of a more contemporary scheme coherent with their business and visual identity. From entering into the bright, colourful reception area through to the colour coded treatment rooms and darker muted transition spaces between; there is an immediate sense of calm with a modern style that feels fun and luxurious but always professional. In short, it feels like a nice place to be which for a health facility has to be a good thing. So my challenge in capturing interior images of these spaces was to represent the spaces true to form, yet highlighting the original use of colour and other design features and way-finding/signage throughout. The team had been helpful in scheduling my visit such as to minimise any disruption to normal business, yet still tied in with a good time of day to make the most of daylight through the south facing aspect the majority of the spaces share. A bit of room dressing/prop styling plus the use of a couple of staff members to provide human interest in some of the spaces helped to set the scene (particularly use of a treadmill in their run-lab!). Most images were captured with ambient light with occasional use of strobe to supplement in darker areas and to clean up colour contamination from those bright ceilings and walls. Shooting tethered (to a laptop) allowed me to check details, focus and get some client feedback on site before breaking down each scene. This is such a helpful tool in my workflow and allows on site collaboration, instant backup of digital assets and gives me absolute confidence that the shot list is complete. In post-production, some minor tweaks to white balance/colour temperature, some blending of flash and ambient frames using Photoshop, re-touching/cleanup work and perspective corrections for shots where I hadn’t been able to use tilt-shift lenses. Paul was delighted with the images which they are now using for their web/social/marketing campaigns, and I now know where my first port of call is should I need any treatments in the future! If you or your business have a space, facility or place that you are proud of and needs to be shared with your audience, specialist interiors and architecture photography can really make the difference. We’d love to hear from you.